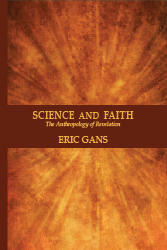 Title: Science and Faith: The Anthropology of Revelation Author: Eric Gans Series: Deferrals and Disciplines Imprint: Noesis Press soft cover 152 pp. USD 18.00 ISBN 9781934542521 August, 2015 Science and Faith recapitulates, focuses, and recontextualizes much of the thinking done in Eric Gans’ two books — The Origin of Language: A Formal Theory of Representation (1981), and The End of Culture: Toward a Generative Anthropology (1985) — that introduced his “new way of thinking,” Generative Anthropology. Science and Faith conceives religious revelation as a cognitive phenomenon, a method for the discovery of human truth. The anthropological truths contained in biblical and other religious texts cannot be perceived by those who treat them as ethnological artifacts. Religion remains faithful to the conception of human origin as an event, a hypothesis non-generative anthropologies refuse to consider. Gans argues that only a human science that respects this fundamental religious intuition is capable of assimilating the human self-understanding on which Western culture, including its science, is founded. Without concern for disciplinary boundaries, Science and Faith asks the most fundamental questions, in the best traditions of the human sciences and the Enlightenment. It will reward a reader similarly willing to “unlearn” preconceptions regarding the “appropriate” scope of inquiry regarding the human. Science and Faith is as intellectually demanding as it is open to all readers prepared to set aside fashionable prejudices about the untenability of speculation about human origins. This new edition of Science and Faith includes a new preface by the author and a new foreword by the series editor. Contents Foreword Preface to the Second Edition Preface to the First Edition Chapter 1: The Scene of Origin Chapter 2: Revelation and Its Object Secondary Revelation: The Birth of Hierarchical Society Revelation and Resentment Chapter 3: The Mosaic Revelation The Centrality of the Mosaic Revelation in the Biblical Text The Name of God The Exoteric Revelation Chapter 4: The Christian Revelation Morality and Ethics Anthropology of the Trinity Chapter 5: Conclusion: Science and Faith Bibliography Index Author Eric Gans received his doctorate in Romance Languages in 1966 under the direction of René Girard. He has taught French literature, critical theory, and film at UCLA since 1969, and published books and articles on aesthetic theory as well as Flaubert, Musset, Racine, and other French writers. Beginning with The Origin of Language (1981), Gans developed the concept of Generative Anthropology and has written several other books on the subject, including Science and Faith (1990), Originary Thinking (1993), Signs of Paradox (1997), and The Scenic Imagination: Originary Thinking from Hobbes to the Present Day (2007). Carole Landis: A Most Beautiful Girl, a life of the American actress (1919–1948), appeared in 2008. In 1995 Gans founded the electronic journal Anthropoetics: The Journal of Generative Anthropology (www.anthropoetics.ucla.edu), which he has continued to edit through 33 semi-annual issues; he has also written over 400 web essays in the associated series of Chronicles of Love and Resentment.